When we released our Sasha Trousers, one of the most common comments I got was “I really want to make these but I’m scared of pants fitting”. As some of you know, I have a major bugaboo about allowing fear to dictate the things you make or create (if you need reminding, this post encapsulates my thoughts on the subject). 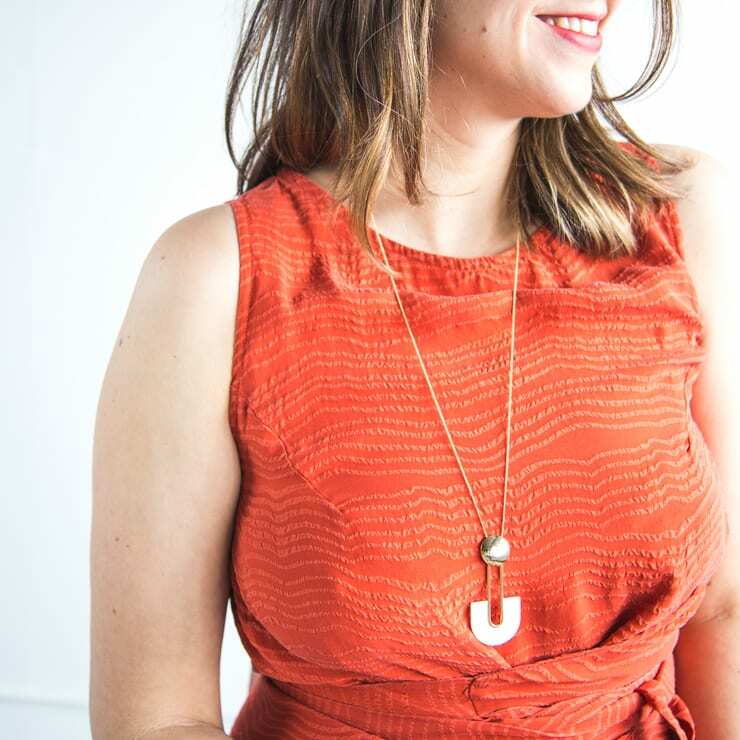 I know I’ve addressed your fitting anxiety in the past, but some things bear repeating, especially if said anxiety is holding you back from making something we wear and need as much as pants. 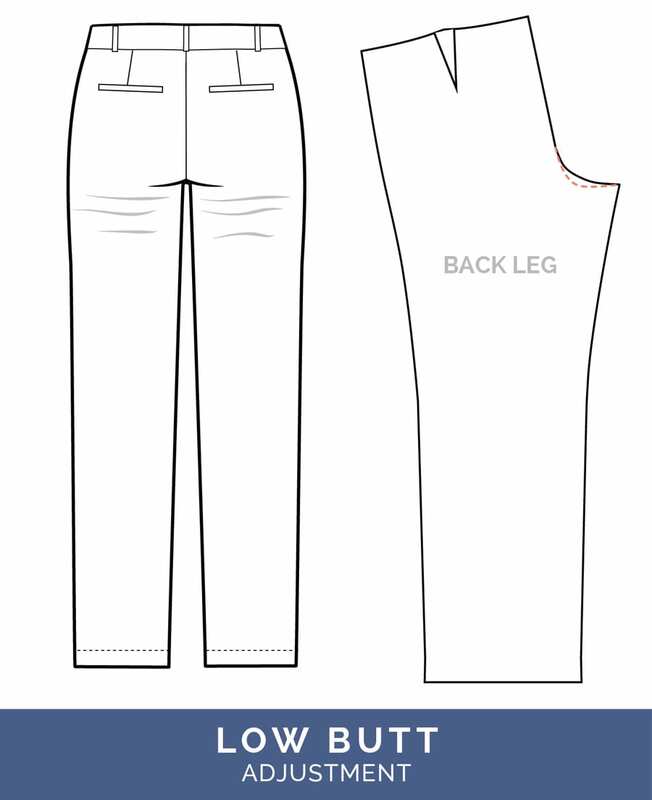 Although I created a downloadable resource for fitting jeans, I wanted to offer something a little more thorough for pants fitting adjustments in particular, especially since some of these techniques will be unique to Sasha (in addition to any other pants you plan to sew in the future). 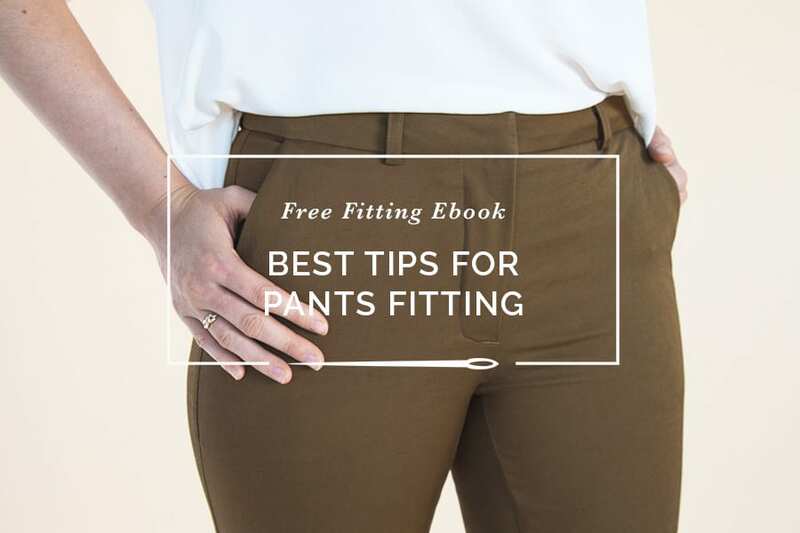 This post will cover the best tips for pants fitting, with illustrations showing you how to diagnose and correct any problems you may encounter. It’s not as complicated as you might think, and I’m hoping you’ll be brave and jump in if it’s something you’d like to do. I’ve also made all of this information available in a PDF ebook you can download and save for later (you need to enter your email address to have it sent to your inbox; we’ll also send you an opt-in email for our newsletter but you don’t have to subscribe to get this resource). Before we start, let’s dust off one of my dog-eared pep talks, shall we? First off, let’s take a few deep breaths. Getting a good fit is great, but not at the expense of spiking cortisone levels. My biggest piece of advice is to view this whole thing as an ongoing, continually improving process. I feel like so many of you put an insane amount of pressure on yourselves to achieve “perfection” when you’re sewing, as if there was some prize or punishment at the end of a project. The only punishment is the pressure you put on yourself; no one else cares, even a little bit. Maybe in some random corner of the internet an armchair fit critic has a passing thought about that random drag line that you’re obsessing over, but that’s about it. Does your partner care? Do your children care? Does your boss or employee or friend or that random passing stranger care? Nope. They all have other pressing concerns and are likely so impressed you made flipping pants to begin with that they will look at you with perplexed, knitted eyebrows when you rant about whatever perceived fitting issue you think is the end of the world. So please, for the love of all that is holy, take a breath! THIS IS SUPPOSED TO BE FUN. 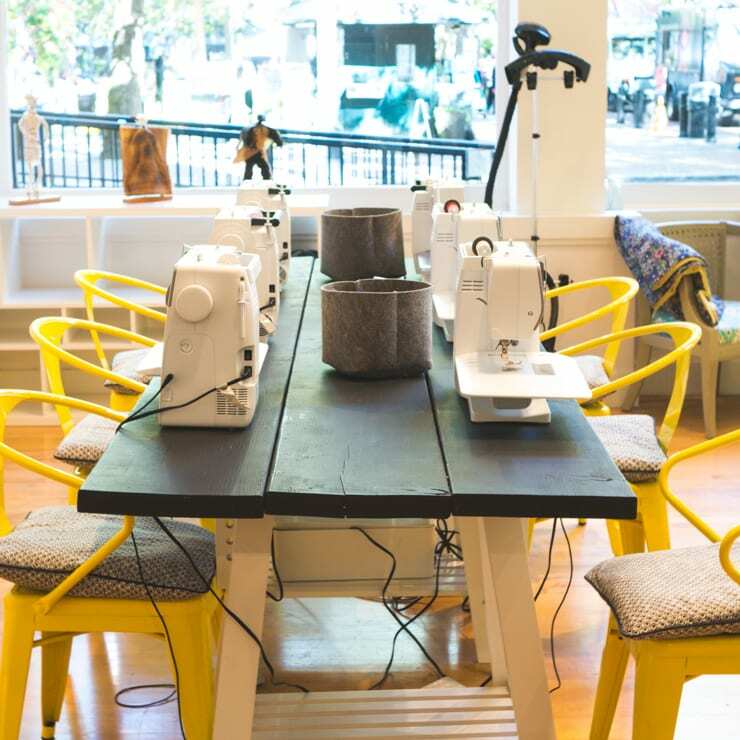 You are making pants because you enjoy the actual time you spend sewing. Actually enjoy yourself. This means doing the best you can to resolve any fit issues, but also learning when to say “good enough”. Saying “Good enough” (and then maybe trying to improve a little the next time around) will mean enjoying your clothes and this hobby a lot more. Unless you’re one of those fit nerds who really enjoy drilling down and tweaking and tweaking for days at a time, I am officially giving you permission to not care quite so much, okay? Good enough is good enough (especially when your good enough is leagues above anything you could buy RTW). Allllll that said… fitting can be an enjoyable exercise if you think about it like the problem-solving activity that it is. It’s also quite a bit easier with a stretch pant like Sasha; stretchy fabric tends to be more forgiving and easier to finetune. 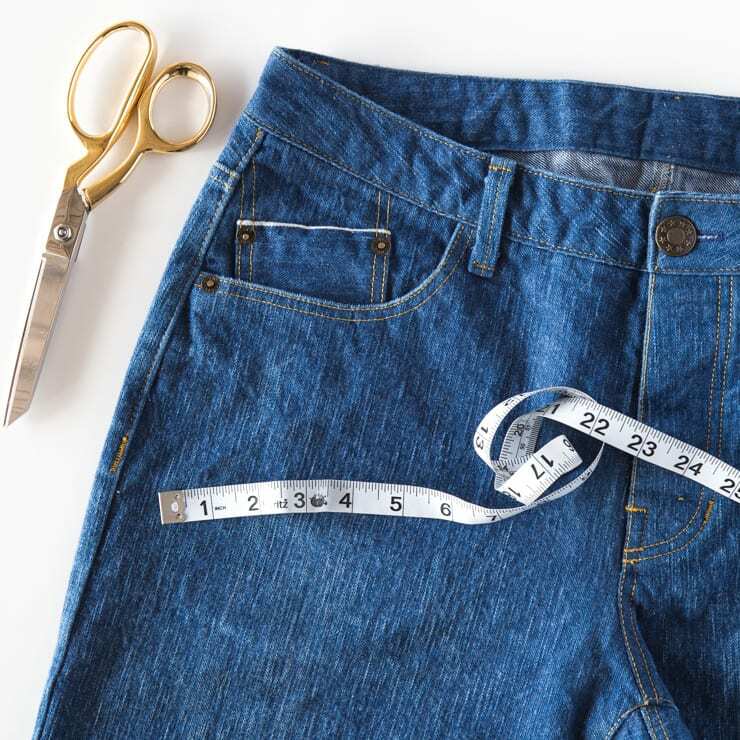 To get started, start by retaking your measurements and confirm what size you need to make. 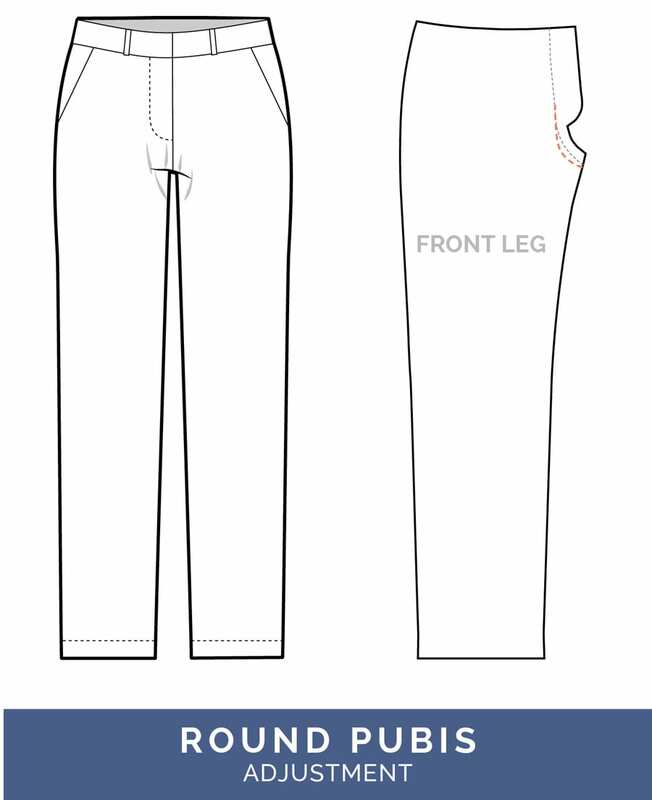 I encourage you to grade in between sizes for the Sasha Trousers if you need to; it will save you time down the road. One thing to note is that just because you’re a size 12 in the hip, doesn’t necessarily mean you have a size 12 leg, at least according to my grading standard. This means you may find you like a slightly looser or tighter leg (or you may need to adjust because of the type of fabric you’re using). If that’s the case, simply add or remove from the side seam before you do anything else. For a recent pair I worked on, I added 1/4″ to each side seam to make a slightly less form-fitting pair; you definitely have some wiggle room here, so don’t feel overwhelmed if the fit through the leg isn’t exactly what you want straight out the gate. 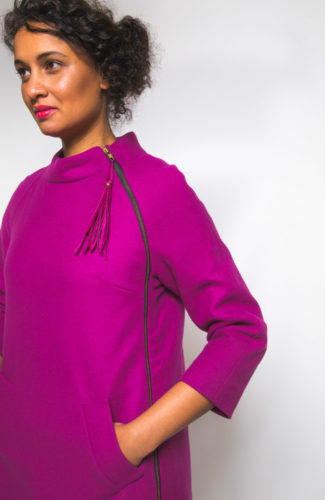 Once you’ve settled on your size, take the time to make a muslin, or at the bare minimum, do a quick baste using your fashion fabric to see what needs to be addressed. You are primarily looking for “drag lines”; these are tension lines on the fabric, and generally point to the source of the problem. You also want to assess feelings of tightness or looseness; your pants should be comfortable and not dig into you anywhere. 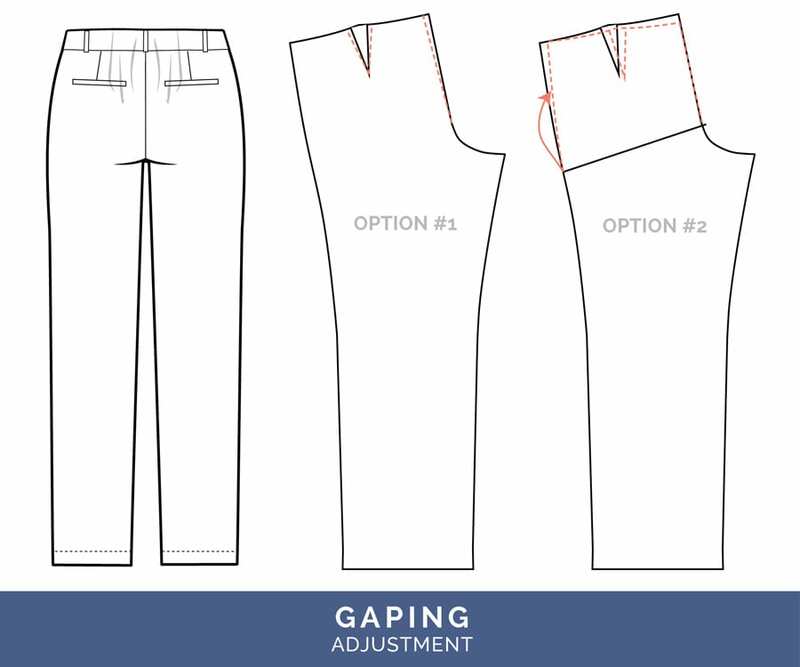 While you should enter into the pants fitting process with the idea of making an incremental improvement (if the pattern even needs adjusting, which on many of you it won’t), I would once again like to stress that having a pair of “perfectly” fitting pants is elusive. 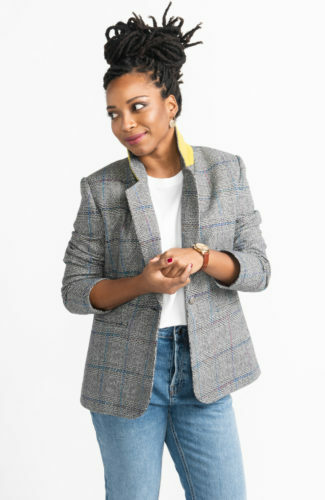 Some horizontal lines at the back of your thighs in slim fitting pants is necessary; it’s called sitting ease. You may have “drag lines” depending on how you’re standing, or what you ate for breakfast that morning. 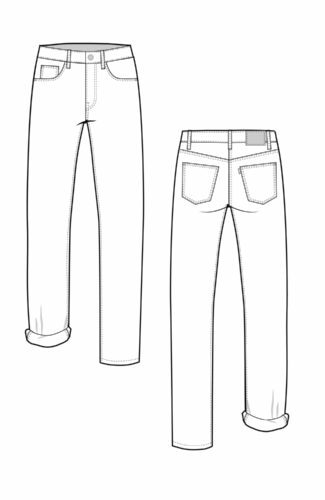 Stop thinking about it in terms of reaching some pants fitting pinnacle, and aim for pants that feel comfortable and make you feel good. That’s all that matters. Here is my advice for studying fit. 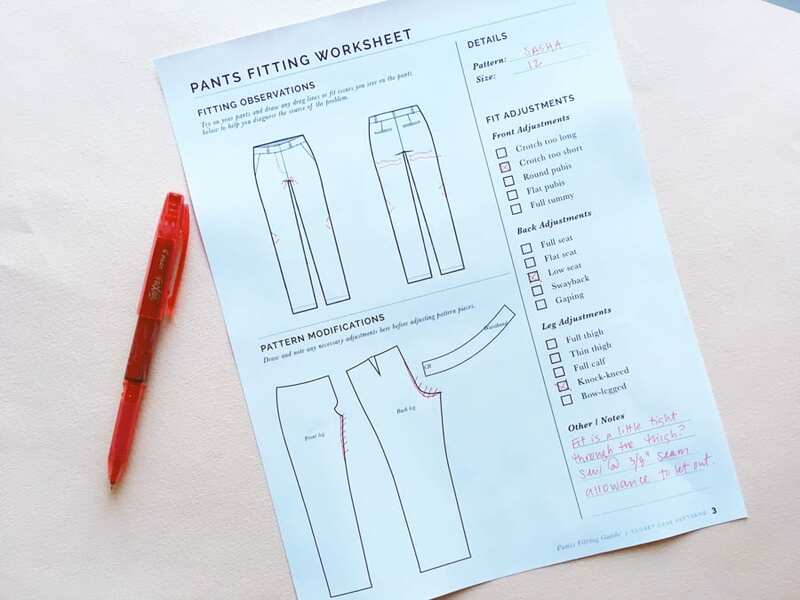 Print the Pants Fitting Worksheet in our PDF ebook. Assemble your basted pants. Make sure the waistband and facing are basted together and sewn to the waist of the pants. 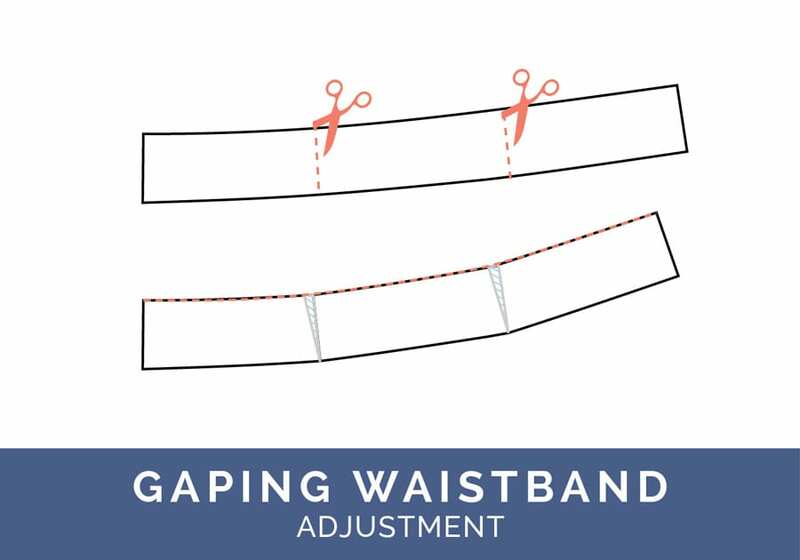 This ensures you are studying the fit of the waistband, and also not stretching out the waist opening of your pants. 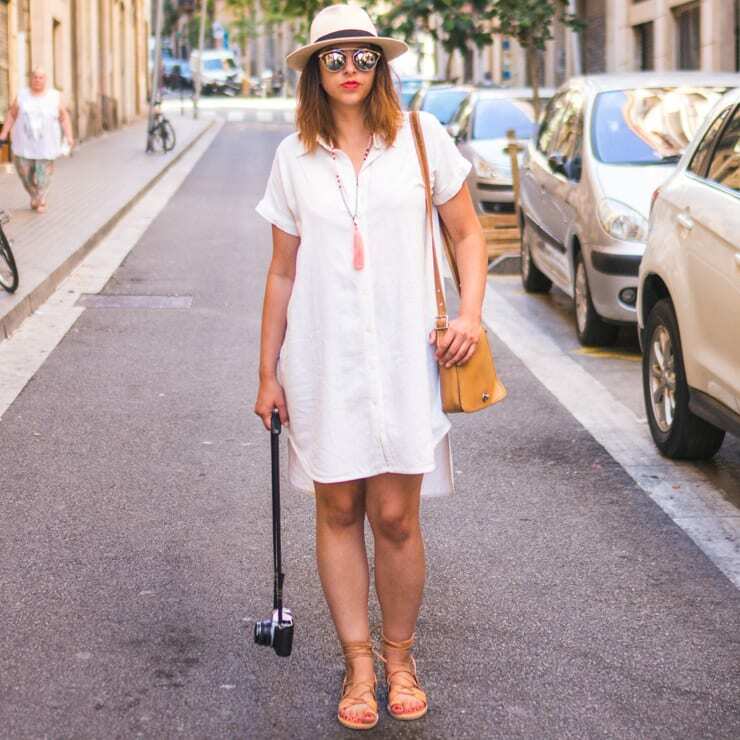 Stand in front of a full-length mirror in good lighting, feet hip-width apart. Look at the front first. Are there any drag lines along the abdomen, crotch, thighs or knees? Does anything feel tight or uncomfortable anywhere? Bend over and squat down. Is the rise high enough for you? Look at the back with a hand mirror, or better yet, have someone take a picture of you. Note any drag lines or feelings of tightness or looseness. Take pictures of the front, side and back with your crotch more or less at eye level. 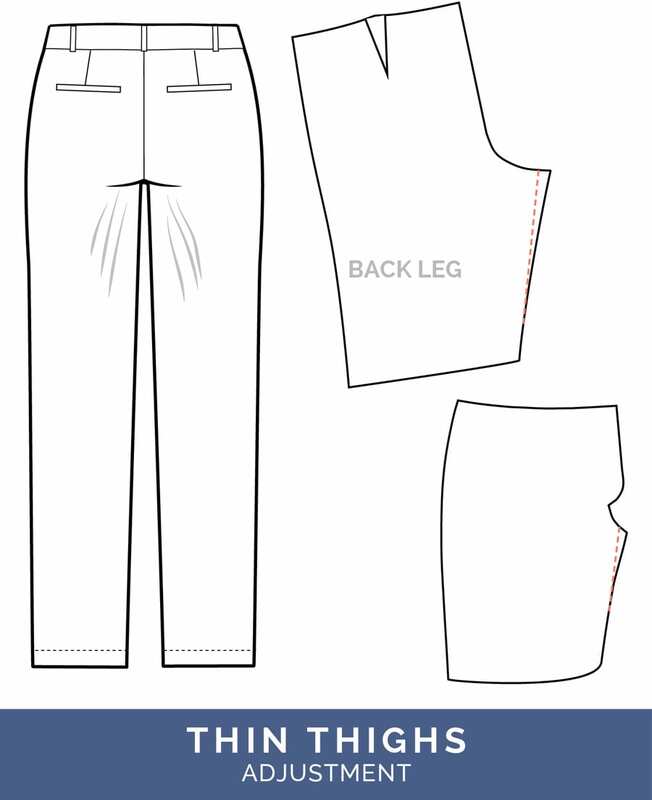 Using the worksheet, draw any drag lines you see on the drawing of the pants, however minor. Make notes to capture any initial observations you have. 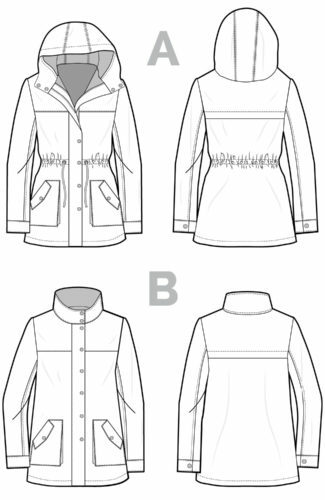 Study the following diagrams to see what fit issues you may be having. 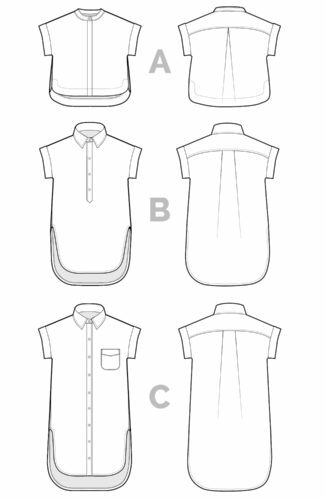 Check off the corresponding adjustment on the worksheet and draw the adjustment you will make to the mini pattern pieces. 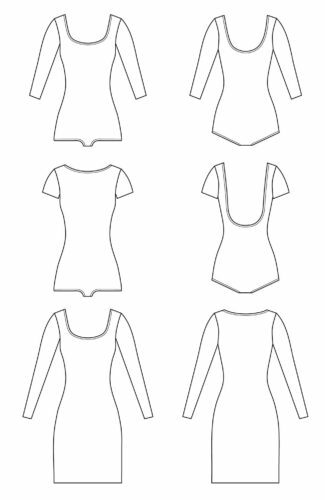 Make corresponding adjustments to actual paper pattern pieces. 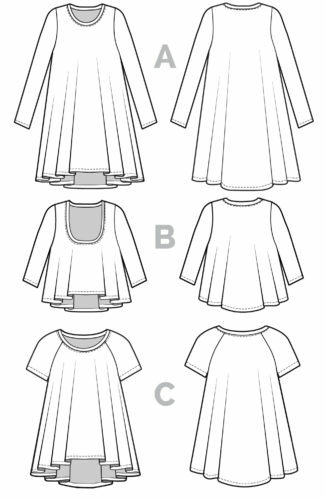 Adjust muslin or fashion fabric you’ve cut out; many adjustments can be made to the original fabric, but anything involving a wedge added or removed (ie. a full tummy or flat seat adjustment) will require new pattern pieces to be cut out. Re-baste and try on. Take more photos so you can study the improvements. Repeat as needed, or take a breath and say “Good enough!”, and get cracking on your final pants. 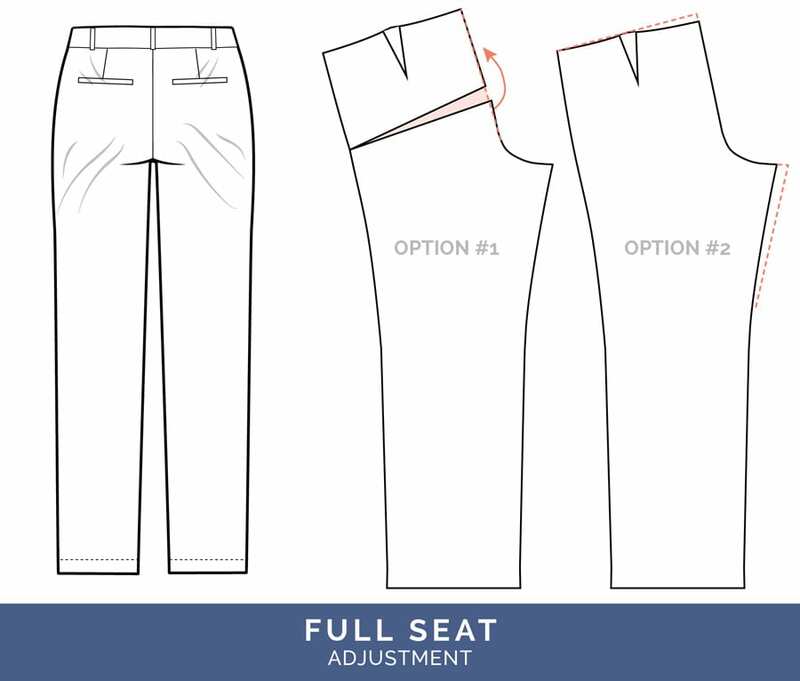 In the following diagrams, I outline sixteen of the most common pants fitting adjustments I think you’ll need to make for the Sasha Trousers. 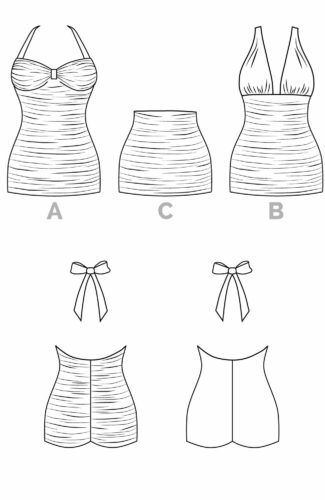 If you’re still stumped, I highly recommend the book Pattern & Fitting Alteration; it’s the most exhaustive fitting book out there. Pants for Real People is also helpful but I find it poorly organized and difficult to navigate, so if you have the budget, the former book is definitely my favorite. Let’s get started! Symptom: Drag lines radiating downwards from front crotch, resembling a frown. 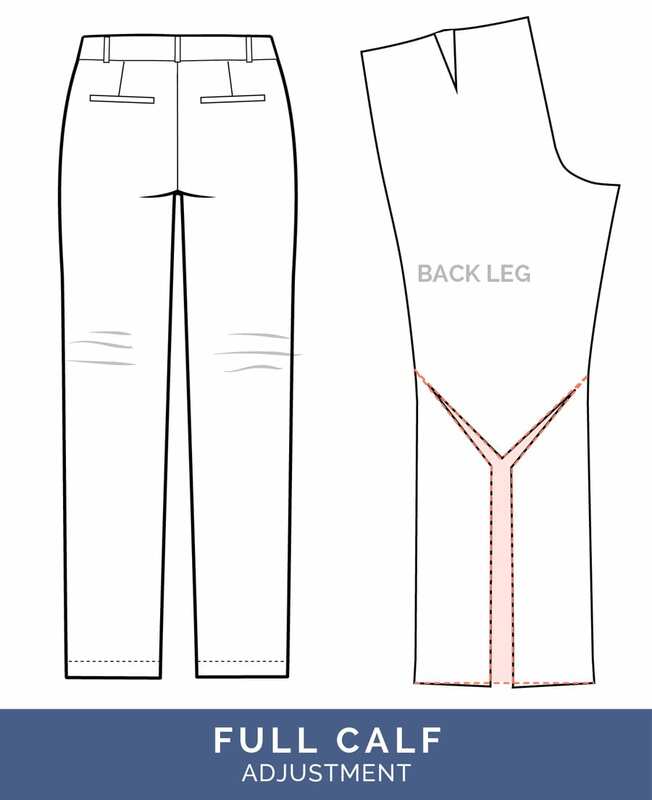 Solution: Remove width from the inseam (or front thigh) to shorten front crotch curve. Work in 1/4” increments since small adjustments make a big difference. 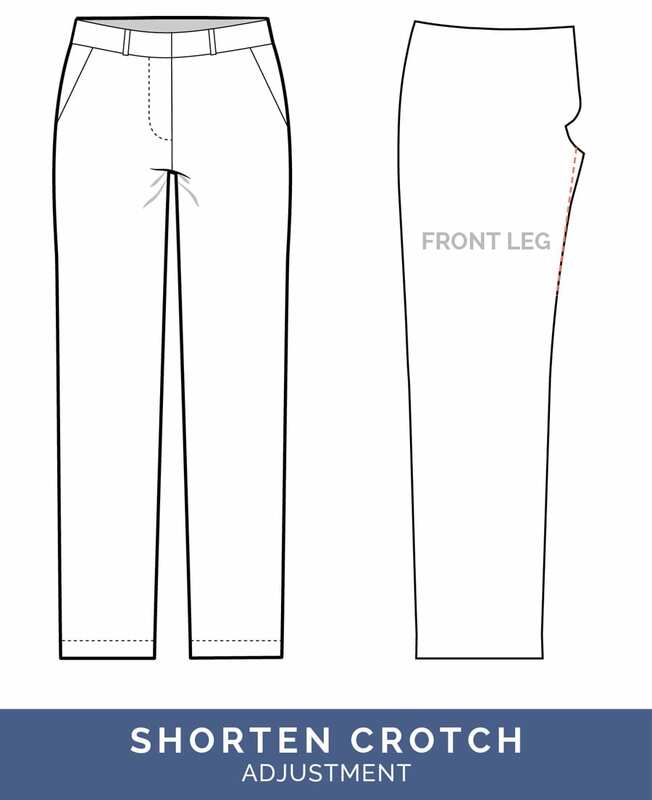 Smoothly join your new inseam line into mid-thigh with a french curve or ruler. Symptom: Drag lines radiating upwards from front crotch, resembling a smile. Crotch will feel tight. 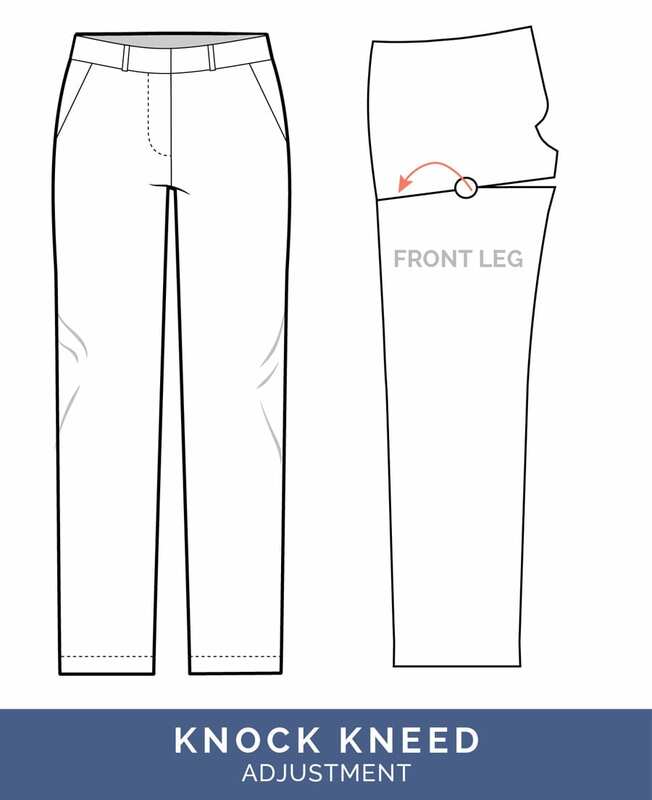 Solution: Add width off to inseam (or front thigh) to lengthen front crotch curve. Work in 1/4” increments since small adjustments make a big difference. 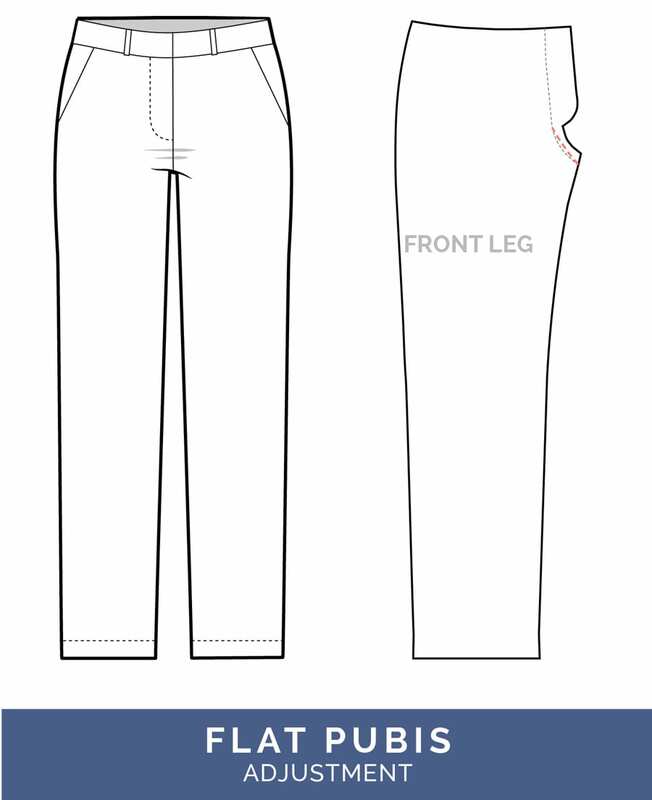 Smoothly join your new inseam line into mid-thigh with a french curve or ruler. Symptom: Horizontal wrinkles at the front crotch may indicate that your pubic bone is a little flatter than what is drafted for. 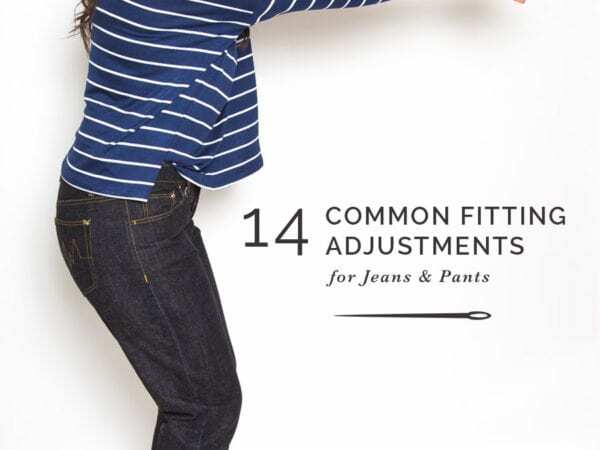 Many horizontal lines spanning the width of the hip indicate that pants are too tight at the hip, so if it feels too snug try letting out the hip first before attempting this adjustment. Solution: Draw in a shallower front crotch curve; this flattens the curve. A 1/4” or 1/8” adjustment can make a big difference. Symptom: Vertical drag lines around the front crotch seam. Seam digs into pubic area. Solution: Scoop out front crotch curve. This deepens the curve and creates room for the pubis. Work in 1/4” increments since small adjustments make a big difference. Symptom: A full tummy may create diagonal drag lines radiating from your stomach. The side seams may also come forward around the stomach, along with a little tightness in the crotch. Solution: To correct, slash along the center front to the hip and rotate along a “hinge” to add length and width through the abdomen area. 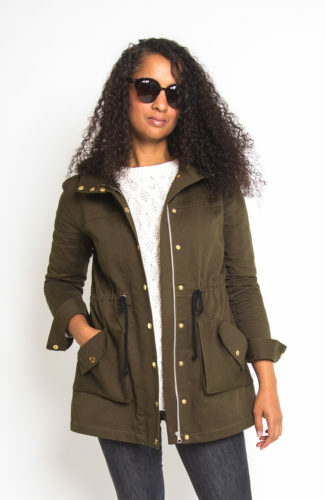 You may also find you need to add a little length to the crotch curve by letting out the inseam. Symptom: If you have a fuller bottom, you may notice drag lines all pointing to the back crotch seam.The back waistline may also be tugged down so it sits too low at the small of your back – this is very common with rounder bums. Option #1: You need to add length to the back seat curve to make room. The proper method is to cut through the center back seam to the hip and rotate along a “hinge” to add length and width through the seat. 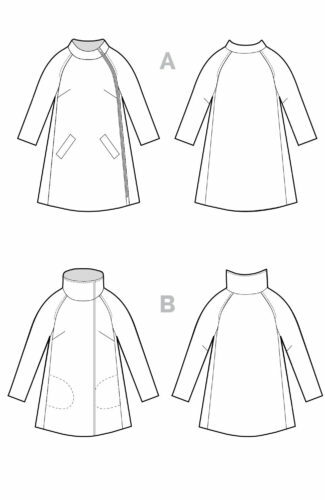 Option #2: A quicker method is to add a little to the inseam and top seam as indicated above. You may also find that you need a deeper seat curve – if you scoop out that curve more, please note you will have to add a little to the hip since you are removing width across the hip with this adjustment. 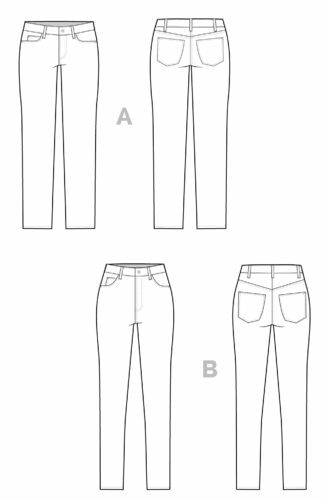 Symptom: Bagginess under the bum with diagonal drag lines pointing up to the hip indicate either a) the upper thigh of the pant is too roomy or b) the seat is flatter than what the pattern was drafted for. Fast method: Remove length from the back seat curve. Start by taking in the inseam. Proper method: Cut through the center back seam to the hip and rotate down along a “hinge” to remove length and width through the seat. 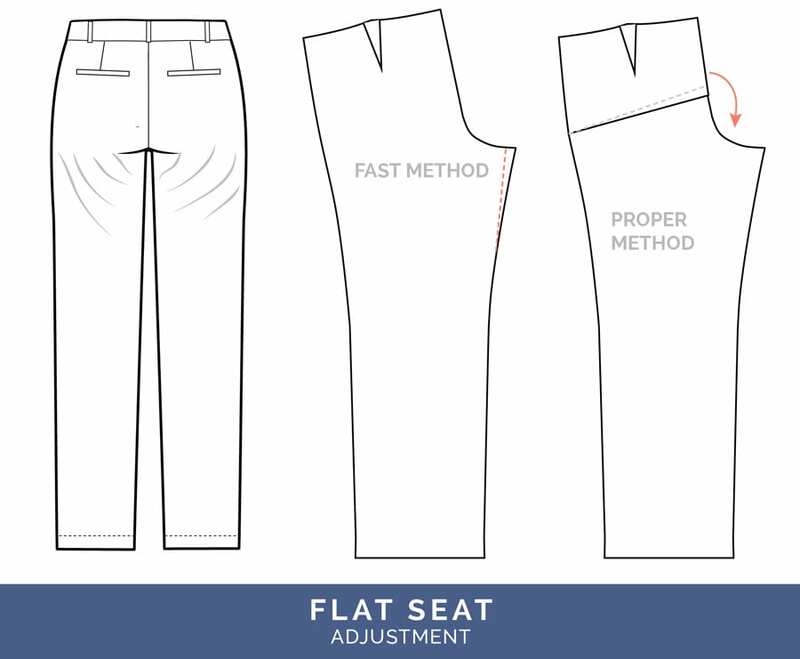 Symptom: If the curve of your bum sits a little lower than the pant has been drafted for, you’ll find horizontal drag lines under your seat and excess fabric at the crease of your bum and legs. Solution: To remove horizontal drag lines, scoop out the seat curve so it makes more of an “L” shape. This will make room for the lower curve of your seat. Symptom: Waistband gapes against lower back. Pinch out excess with a pinned dart so you know how much you need to remove. 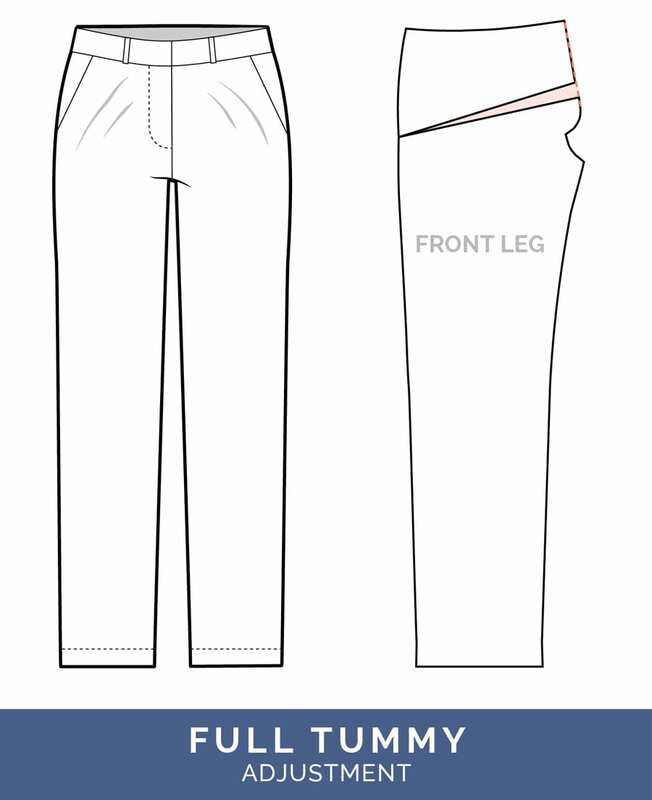 Solution: You must remove length from the top waistband edge so it sits closer to the body. Note the width of the dart you made and cut and hinge your waistband between side seam and center back to remove width to top seam only. Your waistband will now have a more pronounced curve. Symptom: Pant gapes against lower back, below waistband. Pinch out excess with a pinned dart so you know how much you need to remove. Option #1: Try to correct gaping by sewing a deeper dart. If more width needs to be removed, take from center back seam, changing angle of back crotch seam. Option #2: Cut from back crotch seam to hip and leave a hinge. Rotate in top of back leg at hip hinge. Redraw center back crotch seam so the angle is the same before you rotated it. This method removes width at waist and height at the small of the back. 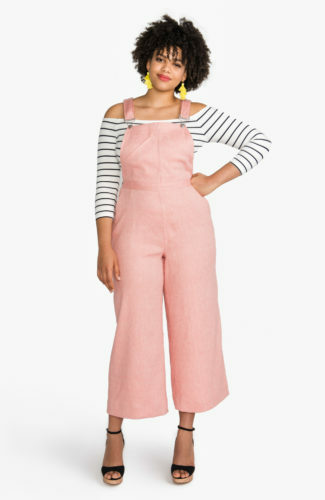 Symptom: Pants pool with horizontal lines below waistband and above seat. This indicates a hollow at the small of the back, with a shorter depth between hip and waist. Option #1: Remove height along top of pant, grading to nothing at hip. Option #2: Cut through the center back seam to the hip and rotate down along a “hinge” to remove length through the seat. 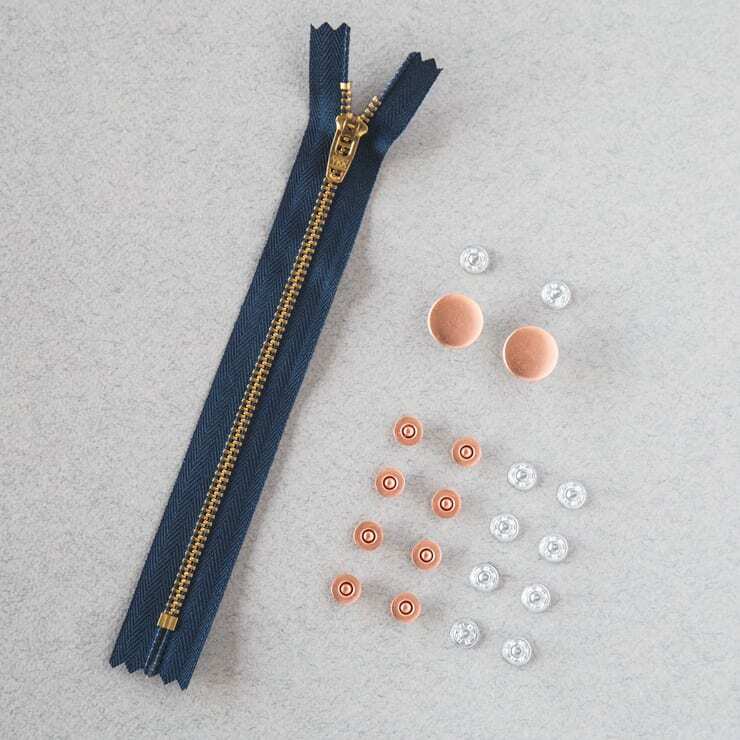 Option #3: Try sewing deeper darts. Symptom: If you need more room in the thigh, your pants will tell you with diagonal drag lines or wrinkles pointing towards your crotch inseam. Solution: Extend your back crotch at the inner thigh to give yourself more room. 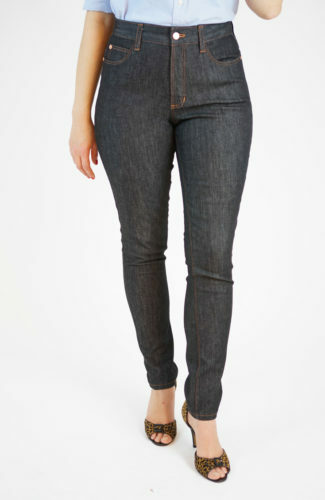 Symptom: If the thighs are too roomy, you may see vertical drag lines along the back of your thigh. Sometimes a thin thigh adjustment resembles a flat seat adjustment with diagonal drag lines pointing up to the hip. 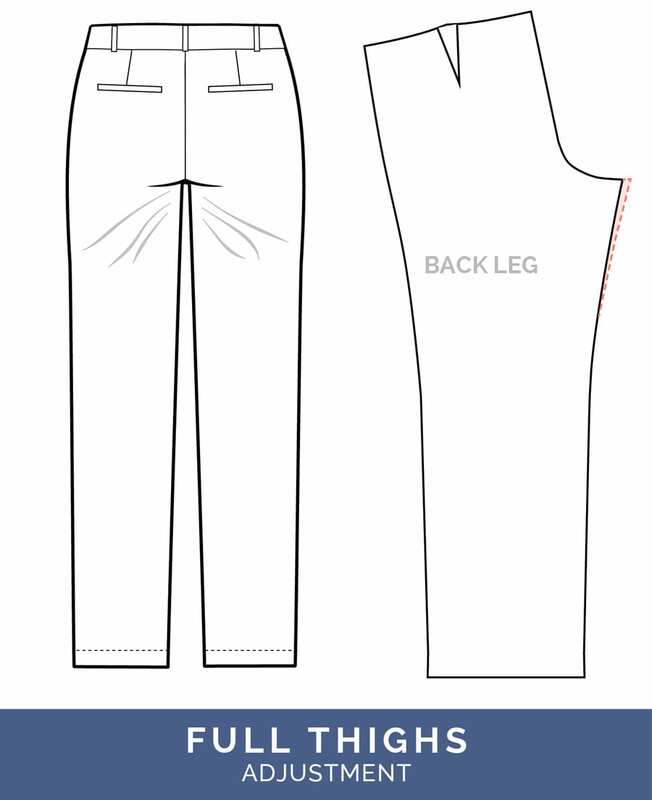 Solution: Taking width off the back inseam will help; you may also need to remove a little from the front inseam as well. Symptoms: Horizontal drag lines above the back of your knees along with a snug fit through the calf indicate the need for a full calf adjustment. If the calf does not feel too tight, try a low seat adjustment first – sometimes scooping out the seat curve can eliminate horizontal lines above knee. 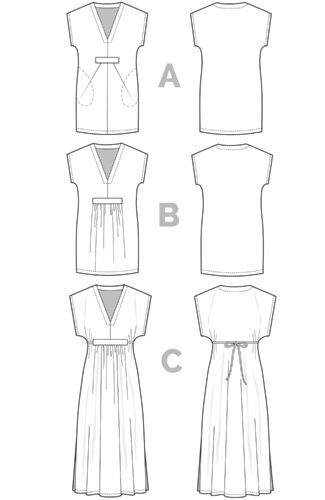 Solution: Cut your pattern as indicated above, and hinge seams along the lower leg to create more width along the back of the calf. This will widen the ankle opening. If you prefer a skinnier fit, you may want to try taking in the side seams below your calf to taper the ankle opening. Symptom: If you’re a little knock-kneed you may find that the fabric is tight along your inseam and looser at your side seam. You’ll see diagonal drag lines radiating from along the side seam above and below the knee. 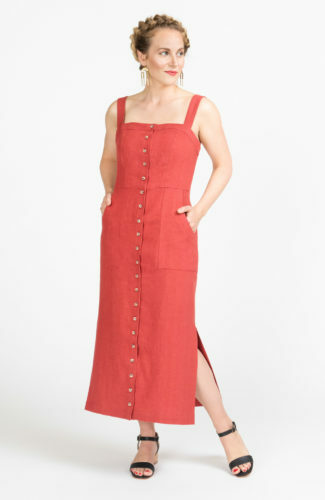 Solution: You need a little more length at the inseam and a little less at the side seam. 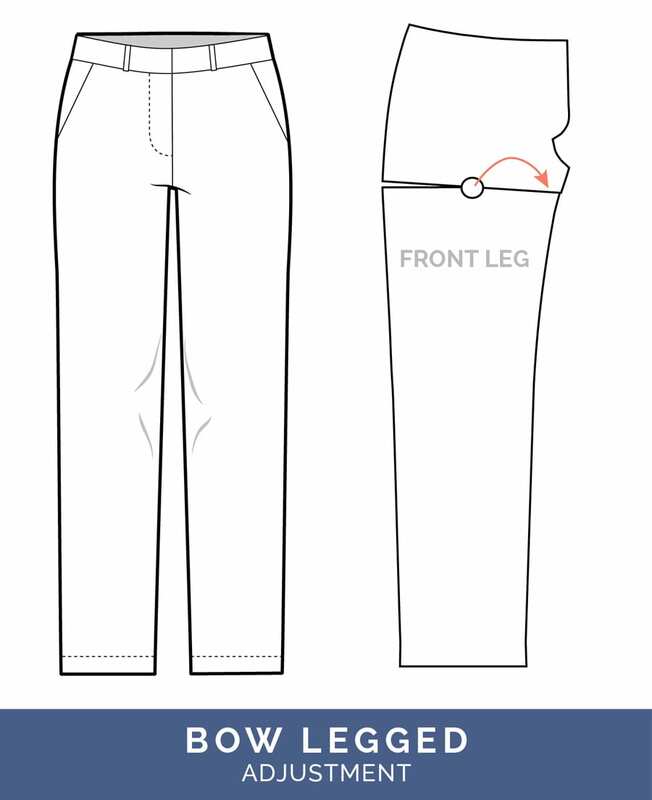 To achieve this, slash to a center point in the center of the thigh on either side and rotate the entire upper pant so that you are reducing the length along the side seam while slightly adding to the inseam. Symptom: You’ll notice drag lines radiating out from the inseam around your knee and calf. Solution: The exact opposite adjustment we made for the knock-kneed; you need more length on the side seam and less on the inseam. 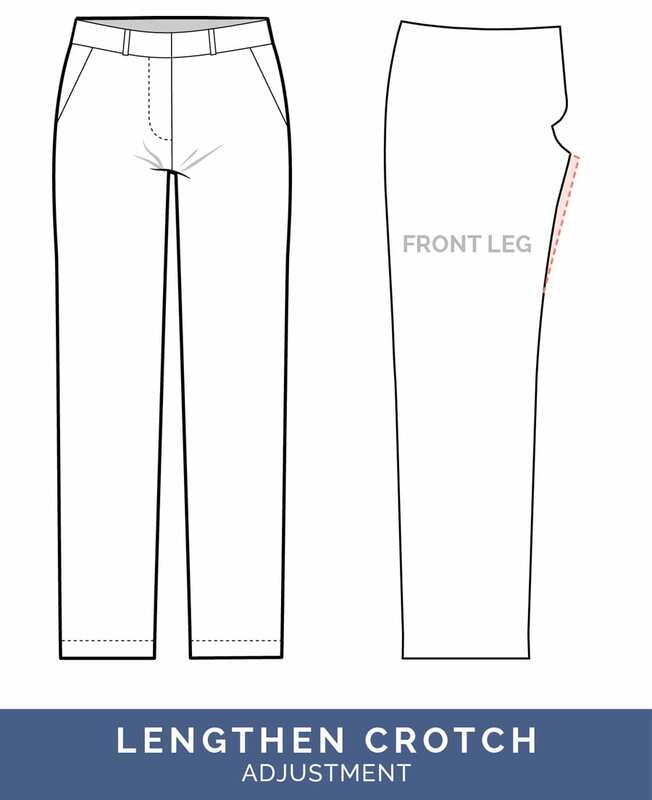 To achieve this, slash to a center point in the center of the thigh on either side and rotate the entire upper pant so that you are adding to the length of the side seam while reducing the length of the inseam. Phew! 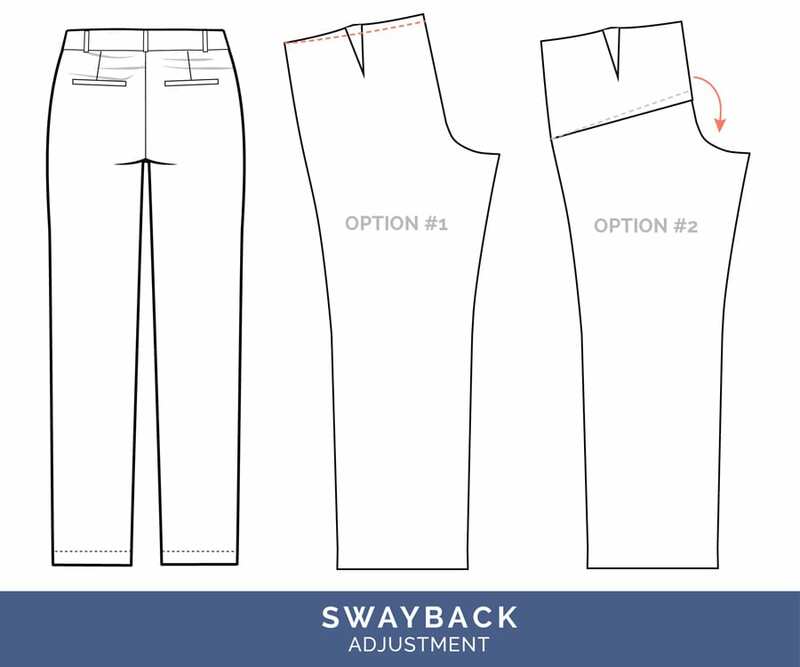 I know this is a lot of information, but hopefully, the breakdown of these pants fitting adjustments has demystified the process a little bit. I know it can feel a little overwhelming, but it’s important to realize that small, incremental changes can make a big difference, you don’t need to figure everything out your first time around, and good enough is good enough. Hope this helps on your pants fitting journey! ps. Don’t forget we’ll email you this entire post as a PDF ebook.